That’s right. You don’t turn the power off on the Boss until he’s done. And apparently not even Sir Paul could sway authorities to keep the show going after concert organizers turned the switch off last week in England. Concert organizers pulled the plug on rock stars Bruce Springsteen and Paul McCartney after the pair defied the sound curfew at London’s Hyde Park, silencing their microphones at the tail end of the show. He then launched into the last minute of Twist And Shout, the Beatles’ song cut short at his Hyde Park concert. Springsteen also held up a sign which read “Only the Boss says when to pull the plug” while wheeling on a huge on/off switch before playing Dancing in the Dark. Towards the end of the show, a man dressed as a London police officer came on stage and tried to arrest the musician. You gotta love Springsteen’s sense of humor in all of this. That said, writing this post and thinking of what other fans have experienced spiritually and emotionally during his shows reminds me that I still have to make it to a Springsteen show. Hopefully the stars do align and I’ll get to see the Boss live and it’ll be as good as this hilarious Dublin show. Have You Danced in The Dark? Were you at the London or Dublin gig? 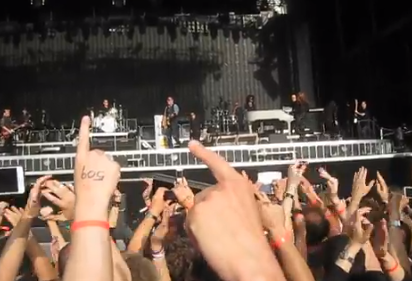 Have you seen Springsteen live? They didn’t “try” to turn them off, they did turn them off! I have been to Hard Rock Calling Festival a few times, every year they pull in pretty incredible acts, the most famous musicians in the world. In terms of this though, I think it’s just noise pollution laws and I agree with it; there’s no reason why anyone has more right to make noise than anyone else. That said, if the festival took place quite literally in the middle of nowhere (instead of the middle of London), then I think there’s got to laws allowing for seriously high noise levels and rave-like gatherings! It is funny that Springsteen uses an on-stage generator for instances such as this. I also admire that at his age, he still puts on some of the longest shows in music, and clearly cares about his fans. However, he had to be aware of the curfew, and could have worked better with the concert promoters.